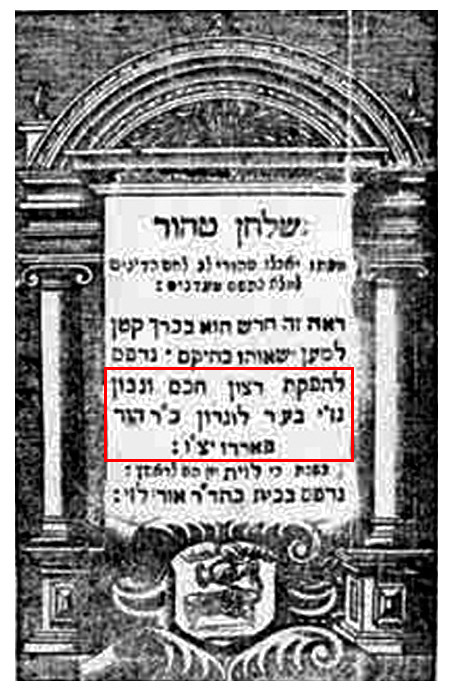 Putting aside for the moment that David Pardo, the Hazzan in London, only published it, but actually his father Joseph was its author - the note states that in the Seder Ha-doros of Rabbi Yechiel Heilprin, 18th century Minsker ga'on and historian/bibliograpaher par excellence, the author of Shulchan Tahor is given as Baer London. And indeed it is. So it says "Printed at the behest of the scholar, sweet singer of Israel [i.e., Hazzan] in the City of London, Rabbi David Pardo." But Heilprin misread - perhaps jotted down a note without looking carefully - and read "be-'ir london" ad "ber london." Adding some flourishes, Felsenthal makes a big deal out of this interesting error and exaggerates that this man who never existed, Baer London, was "made immortal" by Heilprin. Okay, very cute. These are all the Baers that Heilprin listed as authors. And also, there is no Baer London. Baer London is only mentioned in the entry for Shulchan Tahor proper. Here we see him listed as an author. However, he is in parentheses and the reason is because he, as well as others, were added by the learned editor of this edition, Naftali Maskil Le-Eisan. In other words, the editor of this edition improved upon the earlier ones and added author names missing from the text and the list compiled by Heilprin. After all, if Baer London appears in the list of books, should not his name be given as one of the authors? So although Heilprin did, seemingly, make an error and read "City of London" as "Baer London," he didn't quite immortalize him. More like squeezed him into a lengthy paragraph. As you can see, whomever put together the 1696 edition somehow managed to misread the title page of the original 1686 edition, and it was that person who read be'ir london as ber london. That person seems to have omitted David Pardo's name, and replace it with "the wise scholar Rabbi Baer of the Congregation of London" (מהרר בער מק"ק לונדין) - which was accurate insofar as Pardo was in London, it just made him Baer. I can only assume that Rabbi Heilprin had before him the 1696 Frankfurt edition and wrote just what it said on the title page. Sure, he omitted מק"ק, but so what? 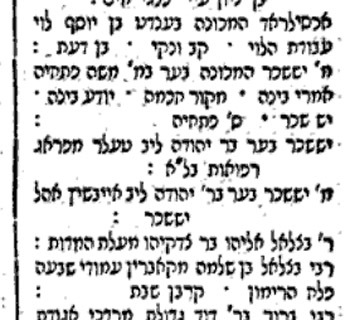 The 1696 Frankfurt Shulchan Tahor said it was printed by Rabbi Baer London, and that is what is repeated in the Seder Ha-doros. 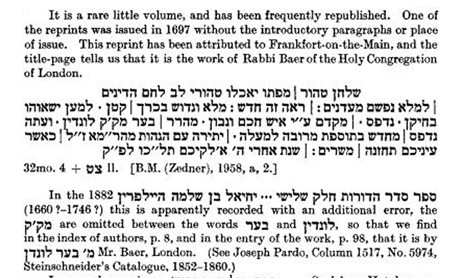 The editor of the Warsaw 1882 edition improved it and added all the various author names in the text proper to the list of authors cited in the Seder Ha-doros. If Baer London was "immortalized" it was by Maskil Le-eisan, who plucked a name buried into a paragraph and gave him a real entry. Note that Solomons tells us that the 1696 edition did not even include the introductory paragraphs, that is, all the stuff by and about Pardo. So it is likely that Heilprin did actually read the Shulchan Tahor, it is just that his edition had nothing about the author apart for the mistake on the title page. "however in a wonderful article from 1928 Israel Solomons seems to have independently noticed the same thing as Felsenthal, but he knew more about the Shulchan Tahor itself." Steinschneider was the first to notice the misreading from the 1696 edition, in Catalogus librorum hebraeorum in bibliotheca Bodleiana (Berlin: Friedlaender, 1852-1860) page 1518. Ahh, busted. I was lazy; Solomons does cite S"S.
I did look up Wolff though, and he gave the Frankfurt edition as 1699, but got the author's name right. Benjacob brings the first edition, and 1696 and 1699. Looked that up too. Almost mentioned that Naftali didn't bother looking it up in Benjacob, but then I thought, well, he did a pretty good job editing Seder Ha-doros anyway. The mythical Baer London reminds me of the Ephraim Kishon story about a typesetter named Isaac who set a news article in Bodoni type. A copyreader left him a note that said, "Isaac: Bodoni is no more in use." This note then mistakenly got transformed into an obituary: "Isaac Bodoni is no more. He died today in the U.S.A." What followed was an outpouring of paid notices by all the major Jewish organizations bewailing their deceased macher Isaac Bodoni. Never heard that one, but I love it! Would have been slightly better if the name was "Yossele Helvetica." Does that mean that smicha given by Rabbi Baer London isn't valid? This is also the essence of the story of Lieutenant Kizhe (as in Prokofiev's Lt. Kizhe Suite). By the way, here is the Suriname synagogue mentioned in that first work. http://upload.wikimedia.org/wikipedia/commons/1/19/Paramaribo_synogogue.jpg Beautiful building.